growing obsessions. 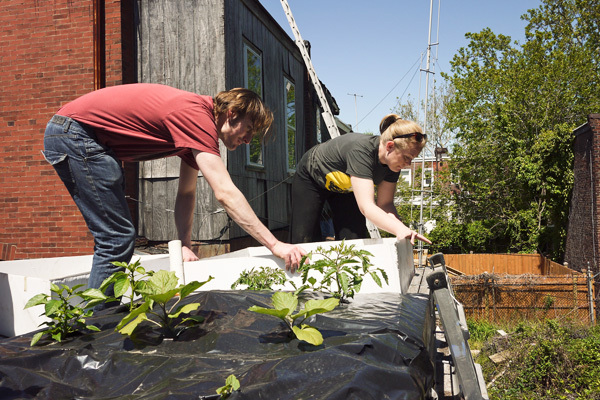 While prominent rooftop gardens in Center City and Manayunk are already raising crops in containers and buckets, the local organization Philadelphia Rooftop Farm (PRooF) is trying another very promising approach. While useful, the typical blue rain barrel isn’t exactly beautiful. So, when the Philadelphia Water Department donated five barrels to the Mt. Airy Business Improvement District this past April, the Mt. Airy Art Garage, a community art nonprofit, volunteered their creativity. Neighborhood artists were recruited and soon word spread, attracting more local artists—adults and kids—to be involved. The Water Department has since donated six more barrels with plans to contribute another nine. The barrels will be used to water flower baskets and tree wells on Germantown Avenue. For more on the Mt. Airy Art Garage, visit mtairyartgarage.org. story by Liz PachecoWhile the city of philadelphia isn’t planning to start a composting program anytime soon (see our interview with Mayor Michael Nutter on p. 12), efforts are being made to divert food waste from landfills. In May, Mayor Nutter and the Streets Department launched the Clean Kitchen, Green Community pilot program. The program is based on a partnership between community group Ogontz Avenue Revitalization Program and InSinkErator, a leading producer of food waste disposals. story byLeah R. TroianoIf you’re using typical household cleaning products to tidy your kitchen, chances are you’re also using some highly toxic chemicals. In an independent, peer-reviewed study by Silent Spring Institute, a public interest organization, more than 200 products were analyzed for hazardous chemical content. Nearly all the products tested, including many marketed as “green” or “nontoxic,” were found to have one, if not multiple, hazardous chemicals. These chemicals, such as phthalates, parabens and bisphenol A (BPA), are linked with asthma and reproductive hormone problems. What’s worse is that these chemicals can end up in your lungs or, if the food or your fingers touch the “cleaned” surface, ingested. The best way to avoid these chemicals? Stop buying cleaning products and start making your own. story by Samantha WittchenFACT: The International Association of Electronics Recyclers estimates that on average 400 million consumer electronic products are thrown out each year. PROBLEM: As more people switch to DVD players and online video services, VCRs are being kicked to the curb. But when VCRs go to a landfill, they also bring heavy metals such as mercury, cadmium and lead, which can leach into the ground and contaminate water sources. VCRs are considered e-waste; their disposal contributes to the more than three million tons of e-waste sent to the landfill each year in the U.S. You can’t recycle VCRs in your blue bin, but it’s worth taking the time to find a place that will accept them. 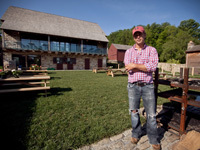 story by Samantha Wittchen"Buy local” has long been the rallying cry of the food movement. Now the renewable energy movement has adopted the slogan to encourage residents and businesses to buy their electricity from in-state sources. And with good reason—the wind industry alone has a big impact on Pennsylvania’s economy. In 2010, it directly and indirectly supported 3,000 to 4,000 jobs, and wind project owners pay $1.3 billion in annual property taxes and more than $2.2 million in land lease payments. story by Anna Herman | photo by Emily WrenNow that summer is in full swing, it’s time to get out of the kitchen and retreat to backyards and beaches to cook dinner (and even breakfast!). Think slow-smoked brisket, wood-fired pizza, rotisserie chicken, sausages, kebobs, fish tacos, skillet potatoes, grilled vegetables. Even eggs and toast, grilled fruit and chocolate banana paninis can easily be cooked outside over hot coals. There is no need for a fancy grill, but I do use hardwood charcoal or wood rather than gas. Wood burns hotter, and the wood smoke adds key flavors. story by Amy StansburySummer is here, but before long the season will pass and so will the sweet taste of sun-ripened fruit. For years, food blogger—and Grid contributor—Marisa McClellan has been sharing her recipes, tips and secrets to keeping those fruits (and much more) available all year long through canning. Now, McClellan is sharing her insights in a new book, Food in Jars: Preserving in Small Batches Year Round. Filled with endearing stories of her personal love affair with jams and jellies, the book is stocked with mouth-watering recipes (including chapters on foods like pickles and syrups) specifically for small batches in tiny kitchens. Grid recently had a chance to talk with McClellan during her book tour and find out more about canning culture. story by Lucas HardisonIt’s summer in the city and why yes, now that you mention it, it is dirty and gritty. No worries, we’re going to set you up with a cold crisp lager brewed right here in Philly, just a short walk from Grid HQ, as a matter of fact. No packaging, no delivery trucks, just some stainless steel tanks and a row of tap handles. interview by Liz Pacheco | photos by Gene SmirnovOn his first day in office Mayor Nutter announced his intention to make Philadelphia “the greenest city in America.” Now, four years later, with his Greenworks plan in full swing, the Mayor has proven he’s serious. Our Green City, Clean Waters program is revolutionizing how cities handle their ancient stormwater systems. The growing number of urban gardens and farms is making access to local, fresh foods not just possible, but commonplace. Our recycling program is actually making money. And our plans for energy efficiency, whether through retrofits, new construction or renewable energy sources, are promising to significantly reduce our reliance on traditional fossil fuels. Recently, Grid had the chance to catch up with the Mayor and talk with him about his connection to Philadelphia parks, his at-home recycling habits and why there’s still hope for solar projects in the city. story by Shaun Brady | photo by Neil SantosAfter 15 years working as a bond trader for Susquehanna International Group, Dean Carlson quit the financial world to become a farmer. Now, instead of derivatives, he deals in cattle, poultry and heritage pigs on a 355-acre farm in Chester County. While the sudden shift in lifestyle may seem like a Green Acres-style flight of fancy, Carlson came to the decision through some careful calculations. story by Berrnard BrownLook up, Philadelphia. Study the clock tower at City Hall and the tops of our Center City skyscrapers to witness the high drama unfolding above the concrete and asphalt. Here the air’s top predators are flying high over rooftops and knocking their prey from the sky at 200 miles per hour. Since 2009, Katherine Gajewski has been the face of sustainability for the City. When she took the job, Greenworks Philadelphia, the City’s sustainability plan, had just launched. Gajewski was faced with the formidable task of implementing the framework as well as overseeing a spectrum of projects that routinely cross departmental lines. story by Julianne MesaricUntil my summer working at the Headhouse Farmers Market, I didn’t know what a real peach tasted like. The peaches from my childhood were firm, fuzzy globes—average, unmemorable pieces of fruit bought from the local box supermarket. Working at the Three Springs Fruit Farm stand changed that.